Hideaki Sorachi (空知英秋, Sorachi Hideaki, born May 25, 1979) is a Japanese manga artist best known for his work Gintama. According to his reply to a manga reader (Gintama Volume 11), he was quite interested in manga during childhood days. However at grade 4 in school he showed his work to his father who promptly laughed at it, after which Sorachi temporarily abandoned his aims of being a manga artist. 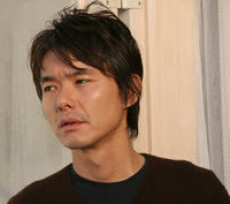 After graduation, he could not find a job, thus he turned to drawing manga (which he had already learned in university). He was able to gain some recognition through his first work Dandylion and subsequently progressed in his career (the comic is shown in the first volume of Gintama, with a foreword by Hideaki stating that it was his first work). Hideaki Sorachi holds a degree in commercial advertising (again, stated in volume 11).